I am posting this recipe retroactively for Gruendonnerstag or Holy Thursday when this dish is traditionally eaten here in southwest Germany. The story of Maultaschen is one of my favorites, which I mention here. 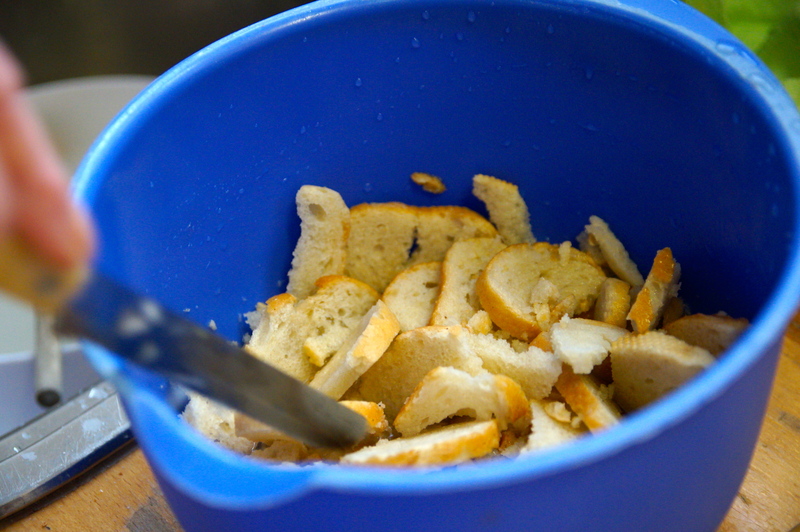 This story and the recipe is one I would love to share more for an English-language magazine. Frau Deibler even has all of the traditional crockery and utensils to create an even more gorgeous photo spread. And to make this all relevant to expatkimchi, it is amazingly similar to a traditional mandu recipe. I have been tasting my way high and low in this land, the cradle and keeper of Swabian Maultaschen. Any time I’ve gone out, I’ve scoped out the Maultaschen, either ordering it for myself or as a soup for my kids. I’ve also gone into people’s kitchens and sampled their recipes, taking copious notes and clicking my camera away of their traditional and not so traditional versions of Maultaschen. I even took a cooking class at our Volkshochschule (community college) elbowing my way through the wait list to get a spot at the Maultaschen session. And I have made my decision. The best recipe comes from my former landlady, who is a real Swabian lady. (She presses her table and bed linens and her family has been in this Swabian city we live in for generations.) 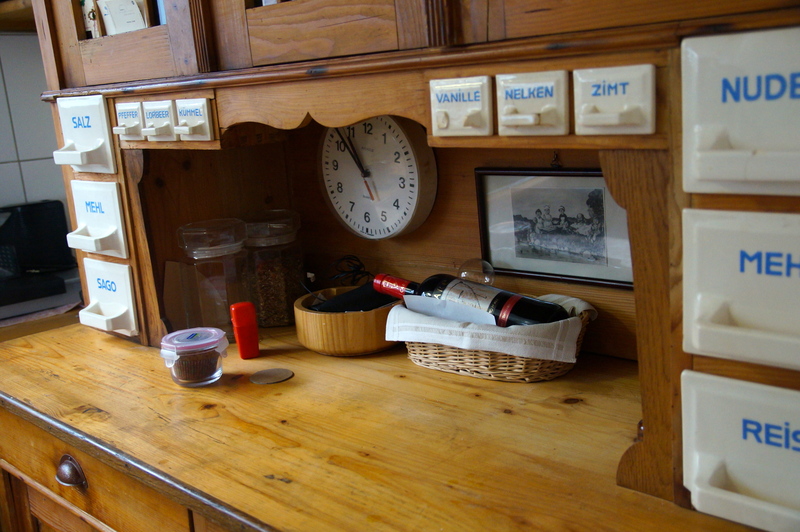 I mean, look at this traditional shelving unit she uses to store her flour, sugar and spices. What I love about her recipe is the high content of spinach and parsley. I never really liked meaty or bready Maultaschen which is what I always seemed to come home with from the butcher. Initially, I mistakenly made the assumption that Maultaschen from the butcher would be better just because it is homemade. Not so, it all depends on the recipe. And as one of our Swabian babysitters commented, these taste very fresh. That freshness comes from the high green content, but especially from the parsley. This recipe is a jewel in the crown. Ready? Start by making the dough as it needs about thirty minutes to rest. The dough requires half a pound of pastry flour (German Type 405), two to three eggs, a teaspoon of oil and teaspoon of salt. Frau Deibler separated one of the eggs and set the egg white aside which would be used to seal the Maultaschen after filling the dough. Adding a tablespoon of water a time, she adjusted the consistency according to how dry the dough looked and felt; floury and crumbly warranted more water. 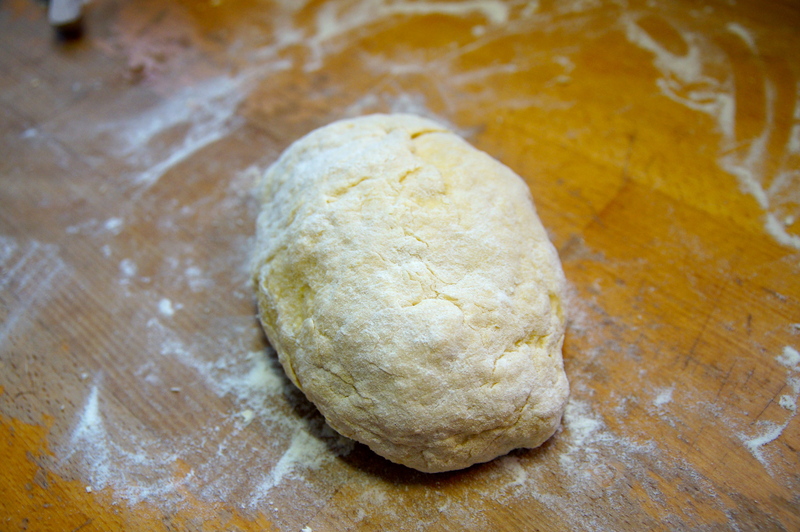 You have to knead the dough repeatedly on a floured surface by rolling the ball forward and back from finger to fist. The consistency should have an elasticity and not be too sticky. Frau Deibler placed the kneaded lump, which looked like an unbaked loaf of bread, in a warm bowl to rest covered by a kitchen towel. We then moved on to preparing the filling. Before I had arrived, she had already sliced two stale, white Semmel or Wecken as they are known here in the south. In their fresh state, they are crusty white rolls eaten for breakfast or dinner with a slice of cured meat or cheese. For Maultaschen though, they were two days old in order to become the bread crumb binding. Frau Deibler soaked her sliced, dry rolls with water and set them aside. I found that the secret to this recipe was the layers of butter she used. First, a half of a medium size onion was sautéed in a fat tablespoon of butter until it became translucent. She then added defrosted chopped spinach and continued to stir until the spinach was heated through, seasoning with salt and tasting in between. She later sautéed the other half of the onion in another giant tablespoon of butter to the point of soft translucency and added half a bunch of chopped curly parsley to gently wilt it. This was all folded into the meat mixture, which was half a pound of minced pork and beef mixed with half a pound of Brät. In Swabia, you can go to any butcher and ask for Brät which is essentially bratwurst filling. Our butcher (she and I go to the same butcher – the best in town) used a finely pureed filling that looked like a pale pink mousse, but I know from my Maultaschen making journey that others use coarse Brät to compliment the other coarser components of the filling. After adding salt she mixed the meats and then cracked in two eggs, mixing everything together again. At this point, she wrung out the water from the two soaking rolls and added 3/4 of this. The mixture was moist at this point. She added that if it looked too moist, she could add dry bread crumbs. The finishing touch was freshly grated nutmeg. We tasted the filling and agreed that there was enough salt and pepper. I asked her why she didn’t add any chopped bacon as I had seen in so many other recipes. Frau Deibler’s family always believed that the smoked flavor would be too dominant not only in the Maultaschen, but also in the broth when it was eaten in a soup. But she conceded that this was all subjective: you could add bacon, and you could put more or less spinach or bread crumbs depending on your preference. Our filling was done and so we checked on the dough. It felt like velvet. She cut a two inch piece from the mound and showed me the air holes which had formed during the time the dough had rested. She proceeded to cut the rest of the mound into four total pieces and used a rolling pin to flatten each chunk onto her wooden countertop. Frau Deibler said that many people say that you should roll out the dough so thinly that you could read a newspaper through it. She said that she never bothered to roll hers out too thinly, since she enjoyed the taste of the dough. On each flattened mass, she spread out the spinach-meat mixture leaving about a centimeter perimeter. It was then that she retrieved out the saved egg white from the beginning and used a pastry brush to line the perimeter with it. Carefully, she wrapped and rolled each dough and spinach mass so that each bit of the spinach filling was covered by dough then sealed the final flap with the egg white adhesive. She used the floured handle of a wooden spoon to even out the now narrower but stuffed long white roll and divided the individual dumplings with it eventually using a small pasta wheel cutter to cut them into individual dumplings. She said that they would be different sizes but that would only emphasize that these were homemade. Meanwhile Frau Deibler had set a large pot of water on the stove top at high and added some clear beef broth bouillon to it. Her family cooked the dumplings in a beef broth believing that it cut through any fatty flavor, but it was also common to cook them in salted boiling water. Ten pieces needed to cook for ten minutes. It was important to cook them right away. Even if you intended to freeze, they have to be cooked before freezing. The most common and soothing way to eat fresh Maultaschen is as a soup, the end result looking deceptively simple: the large pillowy dumpling sitting in a steaming shallow soup bowl full of a simple, clear beef broth with snips of chive. The Swabians, never letting anything go to waste, have variations for serving Maultaschen that might be a day or two old. Slice a dumpling into one inch slices and fry them in brown butter with sliced onions. Served with a traditional Swabian potato salad which is a vinegar, broth based variant, you will have a 100% Swabian meal. The recipe will be in the next post! Tags: cooking Korean in Germany, Easter recipe, German dumplings, Holy Thursday, Maultaschen recipe, Schwabenland, Swabian food, Swabian recipe. Bookmark the permalink. Hi, I am a big fan of maultaschen and I am so glad I found your recipe. Every time we visited Germany we would stock up with as much of them as we possibly could and then hurry home to freeze them. But now that I found your recipe I probably will never buy ready made maultaschen again. I just substituted the meat with mushrooms and toasted walnuts (vegetarian) and they turned out perfect. Thank you so much for posting this delicious recipe. I am delighted to hear that you have found this recipe delicious and useful! Since I am moving away from this region, I foresee that we will also be making this recipe more often. It really is a classic and was the best of the best! This is such an intensive and carefully composed post. What a labor of love and very delicious looking recipe. I love all the details. Thank you! It was an exercise in food writing for me. A lot of fun but quite labor intensive as you note, but at least I was lucky enough to enjoy a couple of delicious maultaschen meals!